P/N: PAE-Kx31 Price: $89.90 Shipping Status: Immediate, In Stock. The PAE-Kx31 offers nearly the maximum dissipation allowed by the footprint of the KX3’s top surface. In addition the PAE-Kx31 offers the highest performance in the minimal volume as proven by multiple tests. The PAE-Kx31 offers the best performance value of any aftermarket KX3 heatsink, delivering more cooling per $ than all others. Weight: 5.5 oz., 156 g.
Warranty: The Kx31 is warrantied against all manufacturing defects. Read all Warranty details here. From the chart you can see that the improvement in key-down time is as much as 300-400% or more, depending on band. 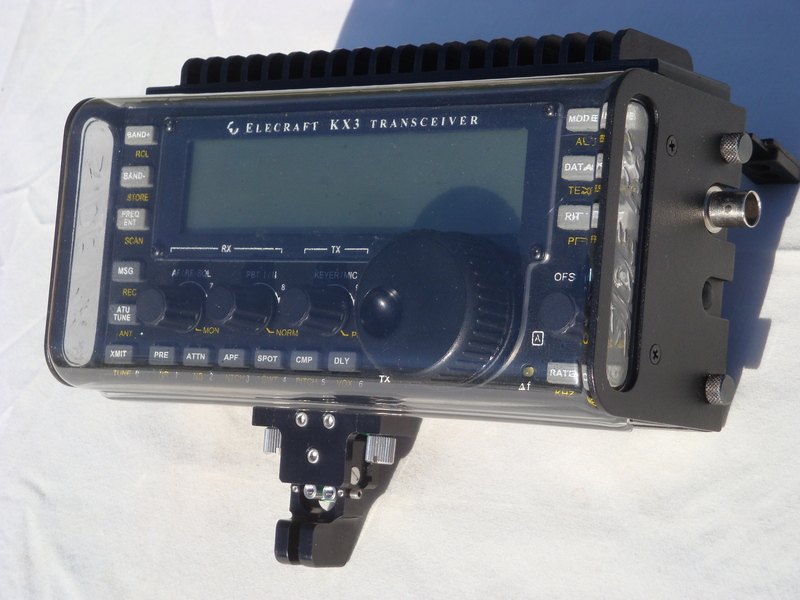 Our goals were to be able to run 10W in digital modes for extended periods on all bands without power fold-back, and to do as little harm to the excellent appearance of the KX3. This heatsink achieves both goals without any fans and without being excessively large (pictures on this site are of the last prototype run, and appearance is subject to improvement, please bear with me!). The KX3 PA designers hit an excellent compromise for 90% of KX3 owners. Considering the PA is broadbanded and consistently achieves low IM distortion performance the design is nothing short of amazing. 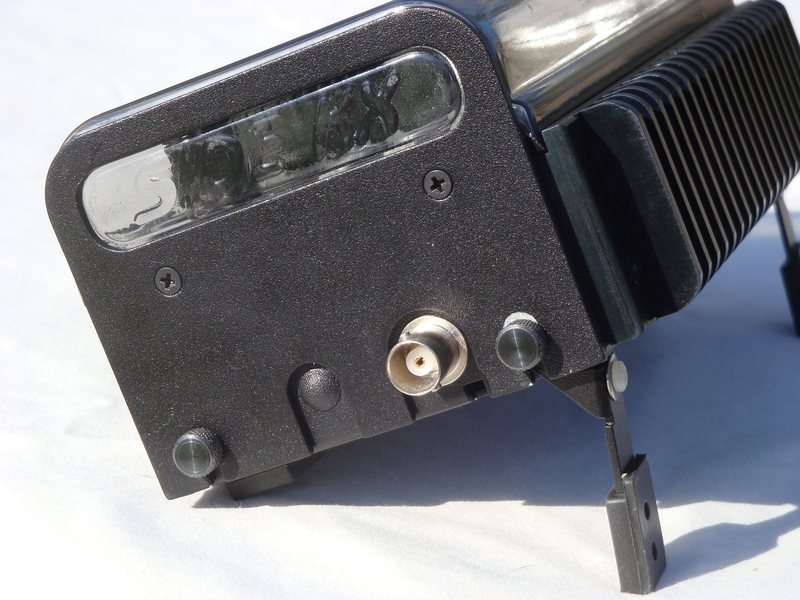 However, many owners would like to have the full 10W available on all bands for extended digital mode transmit time. 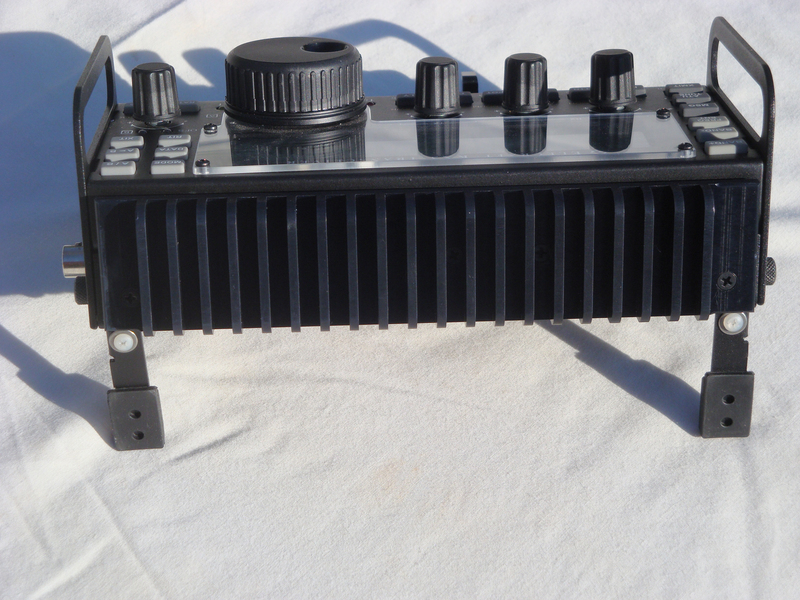 As many have found out, the stock PA thermal solution is less than optimum for extended transmit time at 10W, and for common digital mode usage, especially on the 10M and 6M bands where the limitation is worst. The recent appearance of several dramatically different heatsink designs shows there is certainly a market for more than one compromise of improvement in transmit time vs. change in appearance. The N8WTT flat design works mainly by providing thermal mass, with a relatively small increase in radiating area (~15 sq.in. vs. stock 7.5 sq.in. ), so after the initial heat-soak, the key-down time will begin to decrease with each transmit cycle. On the positive side, it makes a minimal change to the KX3 appearance. We would posit that there are some digital ops who need more heatsink than the flat heatsink can deliver. VE7FMN’s heatsink at ~36 sq.in. radiating area is another design which has its own set of compromises, but I’m sure it too will meet many KX3 owner’s requirements. If you are a Side-KX cover owner you will enjoy enhanced protection from the cover when you mount the PAE-Kx31 heatsink. It interlocks with, and stiffens the top edge of the cover and gives additional protection from impact without making the cover more difficult to install or remove. The design of the PAE-Kx31 is optimum for natural convection, and at 38sq.in, it affords more convective air contact area than others. For both its performance and appearance many hams will find the PAE-Kx31 to be the right choice. Since originally designing and offering the PAE-Kx31, imitators have come on the market, copying features we pioneered like the SideKX cover reinforcing lip which also allows for more heat dissipating heatsink area. Why buy a heatsink from a company copying the original and best? The PAE-Kx31 incorporates more engineering than the competition, so get the highest-performance of any comparably sized heatsink: the PAE-Kx31. 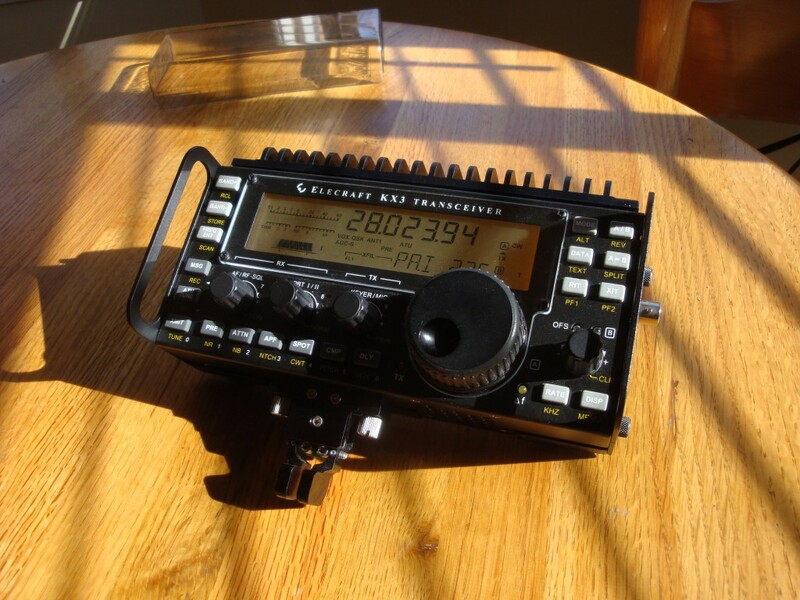 2) I have a new KX3 with the Elecraft Enhanced heatsink. I’ve removed the screws but it is stuck on very tightly. How do I remove it to install the Kx31? The Elecraft Enhanced heatsink is held on by a piece of thermal transfer tape. The adhesive characteristics of this tape rapidly diminish when heated. The good news is that a regular hair dryer can provide enough heat to reduce the adhesion sufficiently to release it. Thermal fold-back for the KX3 is set by Elecraft at 60°C, and a hair dryer outputs air at about 50-60°C (122-140°F). This will release the adhesion with no chance of damaging the powder coating on the KX3. Powder coating softens at around 100°C (212°F), and melts at around 150°C (302°F). We installed one here on a test KX3 and after thermal cycling to 60°C six times then allowing 48 hours for the adhesion to cure at room temperature we indeed found the heatsink to be stuck. Some of the new enhanced heatsinks may be stuck more firmly than ours, and will require persuasion. 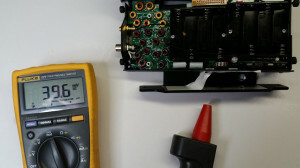 While heating, A small flat-bladed screwdriver wedged between the case and the heatsink on one side will provide the necessary leverage to begin separating the two. 3) Why don’t you offer a thermal pad for mounting the Kx31, I read they make the KX3 run 3° cooler? The equation for optimum spacing and height of fins ends up settling out with ~2:1 fin height to space ratio being optimum. One way to make the heatsink more efficient is to increase it’s length along the fins. This is where the PAE-Kx31 was the first to employ a heatsink more than 1-1/4″ long front to back. The PAE-Kx31 heatsink is 1-1/2″ long, which allows an extra 20% more heat dissipation than our competitors. This extra length would interfere with the Gems Products™ SideKX Cover, so we innovated the unique lip in the heatsink which helps reinforce the cover. Since we first introduced this performance enhancing feature, our competition have copied it, which acknowledges the superiority of the original PAE design. The PAE-Kx31 has other design features which have not been copied, and which make it the highest-performance heatsink of it’s volume on the market. 5) What do the results displayed in the VE7FMN test report on Aftermarket KX3 Heatsinks mean? We are glad to see people doing testing, even if the methodology is sometimes less than optimum compared to a NIST-conducted test program it is an occasion for everyone interested to learn. In the results table in the report, they tested four different heatsinks, our own PAE-Kx31 being one. The KB8UHN heatsink having much smaller surface area was substantially less efficient than the top three heatsinks. The results for the top three heatsinks were presented as a matrix of three runs at two power levels or 18 trials total. Of these eighteen trials, the results obtained were within the resolution of the instrumentation for sixteen of the trials. We did not see any control experiments to document the repeatability of the test setup, so there was no margin of error expressed associated with any of the results. This being the case, we can only overlay the resolution of the instrumentation involved, that being the PA temperature indication in the KX3 itself, which resolves to 1°C. Since resolution establishes the lower bounds of repeatability, the repeatability can be no better than 1°C. That the author was able to get results as repeatable as he was indicates careful attention to test conditions which is laudable! The temperature at test terminus was at 48°C for the CoolerKXPlus, and 49°C for the other two. The 1°C difference for the CoolerKX Plus represents a 4% difference, if it is actually repeatable. This being established, the results confirm our own calculations and testing which we described when we released the PAE-Kx31 six months ago: in the footprint of the top of the KX3, at 25°C ambient and under natural convection, the practical limit of power dissipation is about 6 watts to a 35°C temperature differential. That three different heatsinks of varying proportions (the PAE-Kx31 being the smallest) performed virtually identically verifies this statement. 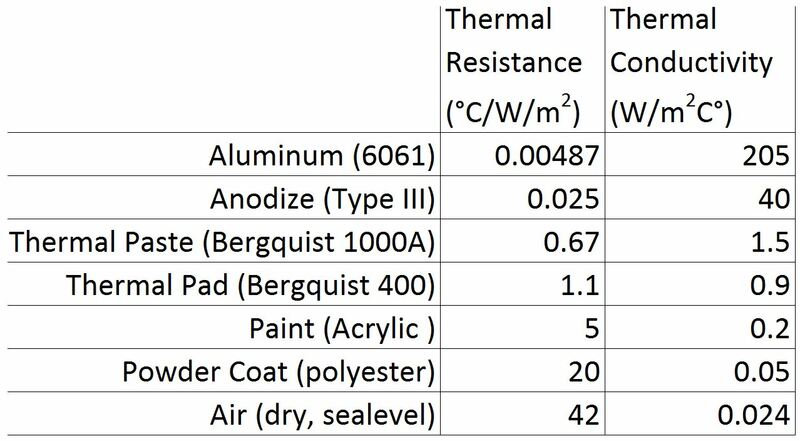 In thermal modeling terms: the thermal resistance (expressed in °C/watt) of the top three heatsinks between the base and the air were all extremely close, and it is not a coincidence. Their performances are all close to the theoretical limit for a parallel finned heatsink with the footprint of the top of the KX3. The author promised to “compare the various offerings based on the ratio of their performance versus their cost,” in other words which heatsink gave the best bang for the buck. Having optimized our design for performance vs. volume, we were looking forward to seeing the results of that comparison. We were somewhat disappointed when a test which just verified the footprint dissipation limit was performed and reported. We can overlay the test results on the initial test intent, which was to show the relative value of each heatsink. This is more relevant and informative to people wanting to decide which heatsink to purchase. Improvement in °C per $ spent. We see now why they changed the testing goals. The fact that this test merely reveals the fact that heatsinks with the same footprint can only dissipate about the same amount of heat. The KB8UHN heatsink, having much smaller surface area does not approach this maximum. This test does reveal that PAE Kx31 design offers the best value per dollar of any available heatsink. 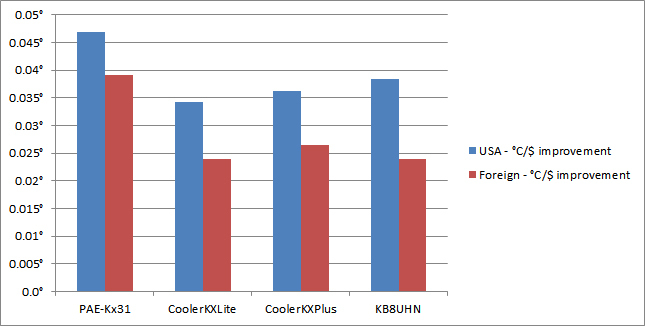 Based on their metrics, to a US ham the PAE-Kx31 offers 38% more performance per dollar than the CoolerKXLite, 30% more than the CoolerKXPlus, and 24% more than the KB8UHN heatsinks. To a foreign ham, the PAE-Kx31 is an even better value, offering 63% more performance per dollar than the CoolerKXLite, 44% more than the CoolerKXPlus, and 63% more than the KB8UHN heatsinks. Our attention to proper design allows us to get the best performance in the smallest volume so the weight and size of the KX3 system would be minimally impacted. Still, the VE7FMN heatsinks are a fine piece of machining, and there is a difference in the ultimate performance between different heatsinks. Unfortunately the test they conducted does not fully reveal them. As Don Wilhelm has pointed out, the design of a test as well as the exact instrumentation and controls determines the accuracy and repeatability of the results. In order to ensure reproducibility between testing labs, calibration standards must be checked and maintained. We applaud the testing just performed, but like many of you would like to see a more comprehensive series of tests to quantify the differences in performance.